The increasing threat of terror attacks, tightening border controls and rising red tape and safety standards are just a few of the dynamics driving renewed optimism towards Digital Barriers (DGB:AIM). This is an advanced surveillance and security business set-up in 2009 by the team behind the old Detica business, which provided technologies and solutions to intelligence officers at GCHQ, the UK spy centre. Tapping into a wealth of intelligence industry contacts built up over more than 20 years, the ambition was to sell governments, law enforcement agencies and corporate clients intelligent, real-time visual security and analysis solutions. These include covert, remote and wide-area installations, as well as vehicle and body-worn applications, requiring significantly less network bandwidth than standard wireless technologies. Progress has been painfully slow. The early years to 2013 saw the company complete a swathe of acquisitions (14 between 2010 and 2013). While this added to Digital Barrier’s significant intellectual property (IP) and initially bolstered revenue, growth failed to keep pace with the company’s soaring cash requirements, forcing the company to come back to investors time and again for more funding. What has emerged is a set of surveillance and video analysis-ready solutions that can be easily deployed by clients rather than them going through a drawn out integration process. These are delivered under the EdgeVis, ThruVis, SmartVis and CloudVis banners. 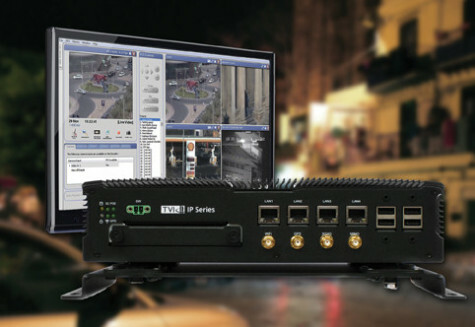 The company gives an example of supplying pre-integrated vehicle video surveillance solutions to police agencies around the world, rather than providing video streaming hardware that a customer would then integrate with third party cameras, antennae, modems and other peripherals. Arguably, Digital Barrier’s biggest breakthrough to date came with its most recent, and costly, acquisition of US-based Brimtek just over a year ago. 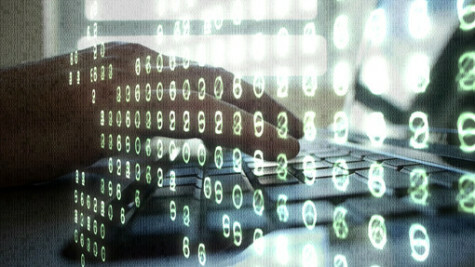 A provider of advanced surveillance technologies to US federal and defense agencies, the $45m purchase appears to accomplish two important strategic aims. First, it adds a high-quality and fast-growing foothold into the US market where security spending has long remained robust, and could potential increase rapidly during presidency of Donald Trump. The company has won several new contracts over the past few months and has seen a five-fold jump in US revenues, helping first half revenue to 30 September 2016 double to a fraction more than £13m despite hardware shortages meaning not all demand could be met. 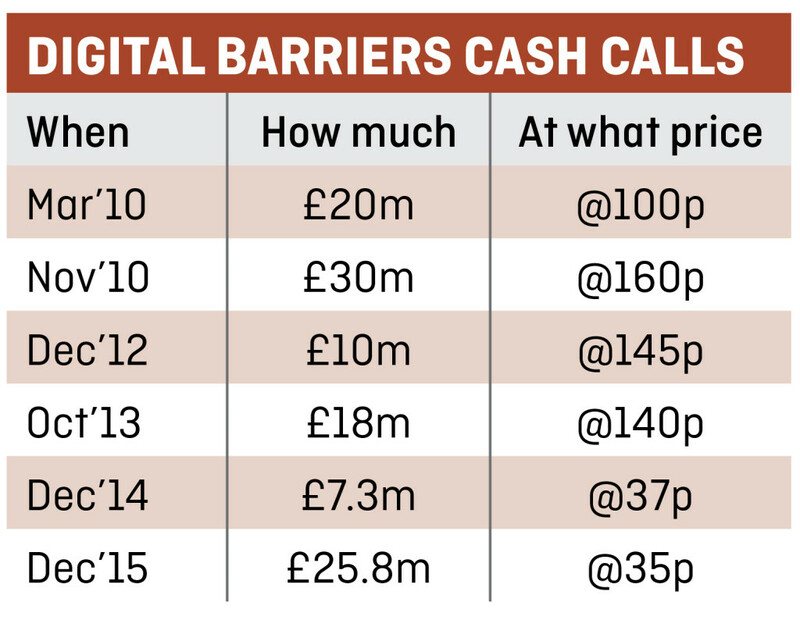 There has already been speculation that Digital Barriers may be in the running to build a digital border with Mexico, a virtual and substantially cheaper barrier than Trump’s envisaged $8bn, 55ft and 2,000 mile long concrete wall. The new business trend has, if anything, accelerated with contracts won through December and a $7m deal signed off this month. This latest award included a new customer in Africa and, $6m worth of work in the US with ‘a major US Federal law enforcement agency’ and existing customer. Presumably, with Brimek now fully part of the company, kit and component shortages won’t happen again, a big plus given the company’s apparent confidence in securing further material sales with US clients. The other vital contribution of the Brimtek deal, and accompanying fund raise, was to shore up Digital Barriers balance sheet. While half year operating losses still ran at £5.9m, cash consumption looks to have peaked at £7.7m in the half. 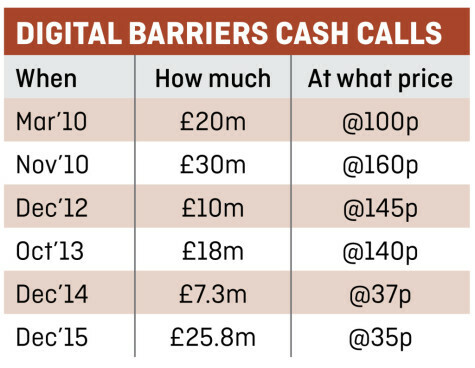 The hope now is that Digital Barriers is finally capable of being self-funding in the future and analysts predict a break into the black next year. Negative earnings before interest, tax, depreciation and amortisation (EBITDA) of £4.6m and a pre-tax loss of £4m are anticipated this year to 31 March 2017 on £38.8m of revenue. The operating performance is expected to improve substantially in the following 12 months, with £45.5m of sales reckoned to produce £3.3m EBITDA and a £2.6m pre-tax profit, the first in the company’s history. It’s been a long and bumpy road for Digital Barriers and shareholders have had to wait very patiently, but there now appears to be more than mere glimmers of hope. Buying Brimtek could be the growth master stroke long desired by investors and there now appears to be a believable roadmap to profitable growth. At 39.75p the 2018 PE of 23.4 is no bargain but there is scope to beat current market estimates if this currently promising new business pace can be maintained.